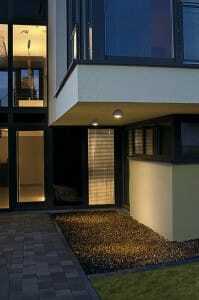 Home »EXTERIOR LIGHTING»Lighting the way to a grand entrance. Lighting the way to a grand entrance. There is something quintessentially British about the entrance to our homes in the good old UK. A refection of our taste and personality. Well, some are tasteful and some not so! We may have hanging baskets, privet hedges, the roses around the door, gnomes or fountains- it all tells a little about you and sets the tone for the rest of your home. Be it manor house or masonette, cute cottage to colossal castle the look of our homes is very personal. Making the entrance both practical as well as personal often involves lighting the front door for both security and safety reasons. The entrance to your home must be – welcoming, safe and secure. How to get the balance between ‘splendour and style’ and practicality of ‘safety and security’. Think ‘Number 10 Downing Street’ -minus the policeman of course! A beautifully maintained gloss black door- no flaky paint here. Being ‘Number 10’ it is no doubt a solid safe front door, and it looks it too! but despite the obvious and not so obvious security it doesn’t look like a fortress (save for PC plod) it simply looks secure and safe. It has a dignified charm. There is the most wonderful wrought iron light held aloft the entrance that really does set the tone. It’s grand, it’s quality, it’s stately and it’s practical. Number 10 Downing Street is just the same as many of our homes -It’s all about balancing security and a warm welcome. We at The Lighting Company took the virtual tour of ‘number 10’ and discovered what’s behind the door is remarkably similar to most hallways. When the door of ‘number 10’ is opened beyond there is a large welcoming open space. Glancing up we spied a grand hall lantern in brass, just as it should be. A hall or console table with mirror above helps to reflect light from the table lamps that sit either side. Table lamps add interest and a cosy warm feel to any entrance hall. In the grand hallway beyond- cheerful sunny yellow painted walls adds contrast to the framed portraits of the ‘great and the good’. The hallway and stairs have very wonderful lamps built into the banister. Lighting that is integrated into the fabric of the building in this case a banister transmits the message of stability. Often libraries, courts,banks and ecclesiastical buildings have this style of lighting. Only to be used in larger buildings. A slightly more realistic way to light the stairway for those us us with smaller homes is to use table lamps instead. Setting the right tone for your home is simply a case of following the same rules as all grand houses and adapt a little to suit your building or sense of style. Many of us have ‘the mirror’ in the hallway and ‘the family pics on the stairs’ as they have at the afore mentioned NO 10, but neglect the lighting! Lighting is a really important element for both security and that warm welcoming. By security lighting we are not simply talking about a flood light that can be a little startling to visitors. Although we all feel safer at night when we can see who’s at the front door, it doesn’t need to be so utilitarian, it can also be a light with style. Sometimes security is just being able to see who’s calling at your door and prettier lights are more in keeping with the style of the property and portray more of the image that suits your home. A light by the door is also helpful for safety too, you don’t want your visitors to trip and it also helps when you are fumbling for your key when you come home at night. The style of light chosen often depends on the style of home for example smaller lights for smaller doors. Coach lantern style lights are often used for townhouse, cottage and terrace home alike. There are many variations and finishes from black wrought iron exterior lights to solid brass victorian or copper outside lights. When selecting an exterior light be sure to choose the right size- many look similar but some are teeny tiny and other are very large. The coach lantern is possibly the most popular as similar in appearance to lanterns of the past that would have been lit with oil or candle. The more expensive exclusive homes often suit more elaborate lights, such as the lights at number 10 which are integrated into the wrought iron railings. The Lighting Company have a exterior wall mounted light called ‘Downing Street’ which is certainly grand enough to grace any grand townhouse.This lantern is very smart, unusual lantern with verdigris finish. Hotels and larger homes require larger lights at the front as too small looks like you have skimped. Solid brass lights are timeless and dull over time a delightful range can be found on the website of ‘Bespoke Lights’ There is also a fashion for large oversized lights in contemporary finishes such as stainless steel, while some people prefer concealed lights. Some houses have porches or canopies above the front door this can look pretty with a hanging lantern or flat to the ceiling porch light. Hanging exterior lights are available to buy that are suitable to withstand weather – even the British weather! The GENOVA hanging lantern is very affordable at under £30 for this leaded effect exterior light. Canopy Lighting under overhang makes an interesting feature and security light. Sometimes it’s just not possible to have an exterior light and the interior entrance hall light acts as both our welcome to visitors and security light. As this light is an interior light it becomes more important that this lights compliments the decor and is not merely functional. 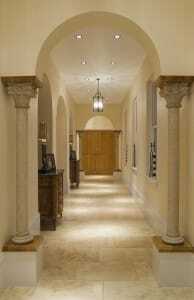 There’s lots of interior decorative lighting styles to suit hallways. Not everyones hallway is the same some are formal traditional styles where hanging hall lanterns are popular, while others are quaint and quirky stained glass and tiffany style lights are characterful. Some of us like table lamps and others prefer minimal recessed lighting or sculptural funky lights. Often hallways vary in size considerably and finding the right size light involves a great deal of searching and deliberation. Ceilings can be high in some and very large lanterns may be the ideal choice -where others are a very small vestibule area with long corridors leading to the main living areas. ‘The Lighting Company’ and sister site ‘Bespoke Lights’ cater for all hallway lighting styles if you need help or inspiration. ← Previous Previous post: Chandeliers Opulent feature lighting.